The Extech S2000i has been renamed to the Datamax-O'Neil S2000i. 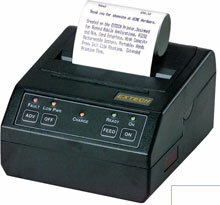 The Extech S2000i is a 2" (57 mm) 24/40-column dot matrix printer with serial/IrDA communications. The S2000i series come standard with IrDA, RS-232, battery, black printer ribbon, 1 roll of paper, -Universal AC Adapter (90-minute Fast Charge) and a 1 year warranty that includes the printhead.